7th Century Eye Covers in T’ang China: What do you see? Did people care about their eyes in the 7th century T’ang China empire? A few months ago I was in the NW region of China, and in a fascinating museum (aren’t they all?) saw in one of the display cases the objects in the accompanying photo to this post. A pair of copper eye covers, a net-shaped hair cover, and a pair of scissors. These objects were found in 1964 when a cemetery in the Turfan area of the NW was excavated. Turfan, also known as Turpan, has been one of the greatest places in the world for archaeological finds, including scrolls of the Church of the East. Many of these objects and artifacts date to the 7th century T’ang Empire of China, which lasted in strength for several centuries. It is interesting that all of these objects were found in a cemetery. We don’t know what they were used for, and if they were simply placed in the graves with the bodies. What would copper eye covers have been used for? (any suggestions out there?) Certainly not as classy T’ang era glasses. Was it because the person had some sort of eye disease? Perhaps the copper eye covers provided an element of protection from infection, and they were then buried with them? More clear would be the purpose for the hair cover and of course the scissors. As all three objects have to do with care for appearance most likely, it does show us that even thirteen hundred years ago there were some of the same needs as today. T’ang Empire Botox, anyone? But back to the copper eye covers. Concern and care for the eyes has been one of the most basic desires and needs in all of human history. It is not unusual to find these covers in a cemetery in China from so long ago. People have longed to see, and see clearly, for all of history. We can be very grateful that today we are in a time when there is so much technology to help us see well, perhaps for the rest of our lives. That was brought out to me personally in the last few weeks, as I found out I needed cataract surgery on both eyes. (See my previous post Cataract Surgery: A New Quality of Seeing ) I asked the doctor what would happen if I didn’t have these surgeries. His answer? “You will go blind eventually.” I decided to have the surgeries. In the T’ang dynasty era, and indeed until the 20th century, people would in fact go blind. The first surgery was almost a month ago, on my right eye, the worst one. As so many could attest to, it went very well and I can see better out of that eye than I can ever remember. My left eye was always better than the right, and I’m the kid who cheated at the eye tests when small. I would cover the left eye, but then peek out of it to help the right eye see the chart at the other end of the room,. But in the past two years, the left eye was developing a cataract as well. I’ve changed glasses twice in the past 18 months because both eyes keep getting worse. It reminds me of a letter the Apostle Paul wrote to the Church at Corinth, in the New Testament. In the great chapter 13 on love in the first letter, he tells them how here on earth they see “as through a mirror dimly”. (Interesting that as they prepare you for cataract surgery, they ask you if it seems you are looking through a “dirty windshield” with cataracts. That does describe it! Also, a mirror dimly!) But someday in eternity they will see “face to face” clearly. What a picture of our seeing right now. On one level here on earth so many things we do not see clearly. We see dimly through a sometimes a very dirty and fallen world. We see via our own sinful and darkened lives. Yet as we surrender our lives to Jesus, we receive new sight spiritually. It is not complete sight, for we still in many ways see dimly compared to how we will someday see with brilliant clarity. We are between the times. We see with one eye of clarity and one of fogginess. All is blurry and full of mystery, and yet all is blindingly beautiful and clear. Kind of like being between cataract surgeries. 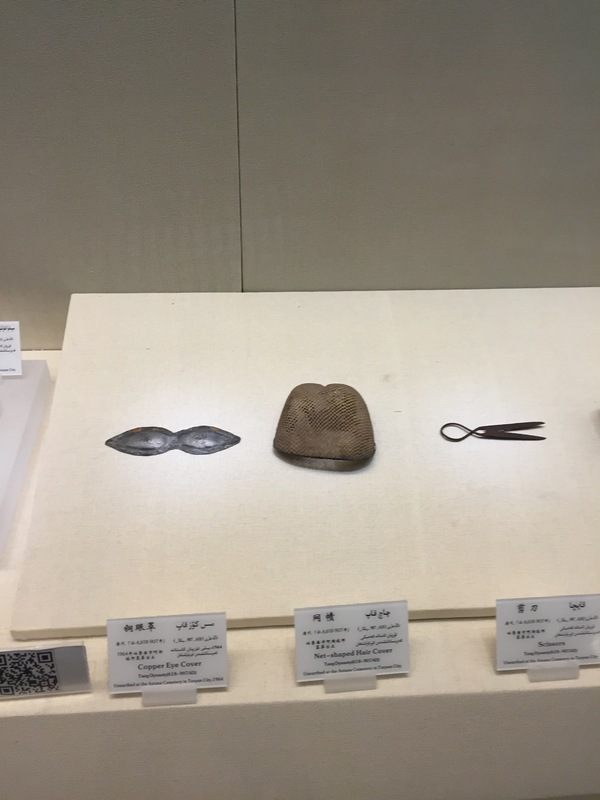 What were copper eye covers used for in 7th Century T’ang China? I have no idea. But personally I’m very grateful that I live now and not then. If all goes well tomorrow I will see colors clearly out of both eyes. But the ultimate clarity in vision will only come later in eternity. Next Post Where did the Wise Men come from? And go back to?